With a 30-41-11 record to finish the 2014-2015 regular season, the Carolina Hurricanes would probably like to put the year behind them and start anew. They went 18-16-7 at home, but their road record was a dismal 12-25-4. They only managed to score 183 goals on the season, with only the Arizona Coyotes, Buffalo Sabres and New Jersey Devils scoring fewer goals. General manager Jim Rutherford was shown the door after a 20-year tenure with the franchise. 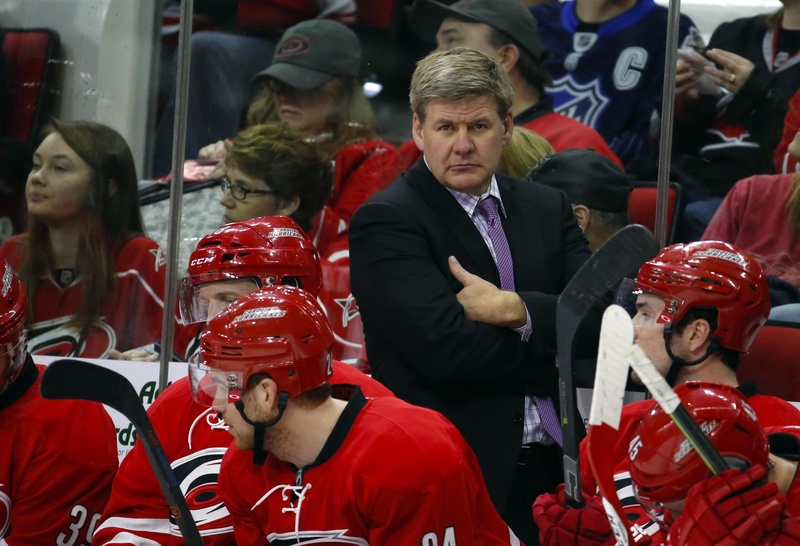 Ron Francis is the new boss, with head coach Bill Peters behind the bench. The new blood in the front office took some time to settle in, initially bringing back former Hurricanes like Tim Gleason before trading him over to the Capitals. The job going forward is clear: Carolina needs more scoring and they need to forge a new team identity. There are good pieces here and the addition of goalie Eddie Lack is certainly a creative one, but the Hurricanes have to work with what’s available. On paper, the Hurricanes look like they should be able to hang offensively. In reality, this is a club that’s had trouble powering the attack. Eric Staal is still the man in Carolina, putting up 54 points in 77 games last season. He scored 23 goals and remains one of the team’s most versatile and effective forwards, even if his faceoff numbers leave a little to be desired and his playmaking abilities have taken a dive. Jeff Skinner is another top-tier player. He put up 31 points last season, his lowest totals apart from the 2012-2013 season. He was a dismal minus-24 and continues to find himself at the core of trade rumours, which isn’t the best situation to be in as a player. Expectations are that Skinner will be traded by the time the 2015-2016 season gets underway, but Carolina’s been having trouble finding a dance partner. Jordan Staal is a solid second line centre, with 20-year-old Elias Lindholm proving another adaptable option on the wing. Lindholm had 39 points in 81 games last season. Nathan Gerbe, Victor Rask, Andrej Nestrasil, Chris Terry, and Jay McClement round out the forward group. It’s not hard to see why this group struggles with offence, especially with the likes of Skinner no longer producing at a regular rate. Defensively, this is a mixed bag. Justin Faulk leads the way. He put up 49 points in 82 games last season, including 15 goals. He’s maintained a confident level of play in Carolina and still has some considerable upside, so that should keep him powering the play for years to come. Faulk can power an offensive attack from his own end, but some defensive lapses keep him from being a complete player. 34-year-old Ron Hainsey represents the side of Carolina’s defence that could use a little work. He’s certainly a mobile player, but he’s far from the most intimidating defenceman in the game and is prone to consistency issues. Hainsey only potted 10 points in 81 games last season. Luckily, he’s balanced out by the newly-acquired James Wisniewski. The 31-year-old isn’t a magical solution to Carolina’s woes by any extent, but he can put up numbers and plays a quality up-tempo style. The problem is that the Hurricanes haven’t been able to determine the best way to use the parts they have. 19-year-old defenceman Haydn Fleury will put up big minutes and has significant size to work with, while 2015 draft pick-up Noah Hanifin is one of the most intriguing possibilities the team has. Fleury and Hanifin could be in for a long season, but they should have plenty of time to prove themselves. Eddie Lack, fresh from his tenure as a fan favourite with the Vancouver Canucks, will have the chance to start again in Carolina. He’ll bring a strong personality to the Hurricanes, which is a good thing for a club struggling with identity issues. And he’s a quality goalie, with great size for the position and the knack for making agile saves. Lack will keep things calm and that will go a long way to helping this uneasy team. 31-year-old Cam Ward still has the capability to be an excellent goalie in this game, but he’s been struggling in Carolina and has had trouble reaching the heights of his earlier career. With Lack in the fold, Ward may have the chance to find his game again. Injuries have been a problem as well, but a more reasonable workload should help in that regard. If there’s a silver lining to the 2015-2016 season, it could be the re-emergence of Cam Ward. Hanifin and Fleury are two of the more compelling players in the system and their impacts could be immediate. They are just part of Carolina’s deep prospect pool of defencemen, which also includes the likes of Trevor Carrick, Jaccob Slavin and Brett Pesce. Carrick is of particular interest, with a physical upside and the tenacity to serve as a solid stay-at-home blueliner. The centre position is in good hands, too, and that’s a good thing. Beyond the Staal brothers, Carolina levels off considerably down the middle. Luckily, Nicolas Roy, Lucas Wallmark and David Cotton are turning some heads. Wallmark is one of the most creative players in the group and he’s not one to give up on plays. He’s also great in the faceoff dot and can drive possession, even though his skating still needs work. Let’s face it: this will not be an easy year for Carolina. Despite some front office shuffling, this is very much the same team that took to the ice last season and the results could very well be identical. Adding Lack in goal is the biggest and best move the team has made thus far, with his presence making things easier on Ward. Defensively, the future is bright for the Hurricanes and that’s a good thing. The transition could be a tough one and Carolina’s fans had better get used to inhabiting the league’s basement for a few years, but the payoff should be rather grand. The likes of Hanifin and Fleury will make things happen on the blueline eventually, with 2015-2016 providing more of the same for this hockey club. Next Should the Hurricanes Trade Jeff Skinner?